Both Africa and the Middle East are blessed with enormous solar energy resources. Electrification is an urgent need in Africa, where many of its 54 countries are among the world’s fastest-growing economies, but where half the population still has no access to electricity. Solar energy is seen as the fastest and cheapest path to addressing this need. Oil-rich countries in the Middle East are turning to solar energy to meet the growing domestic demand for electricity, freeing up hydrocarbons for export. 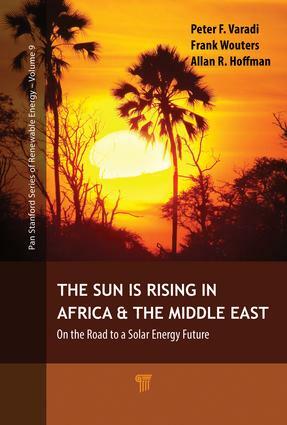 This book describes the energy transition in Africa and the Middle East, from dependence on fossil fuels to increasing reliance on solar energy. The authors were assisted by the contributions of top experts Wolfgang Palz, Anil Cabraal, and Richenda Van Leeuwen in their efforts to provide a sound basis for understanding where solar energy is heading in these two important global regions. Peter F. Varadi co-founded Solarex Corporation, USA, in 1973 to develop the utilization of solar cells for terrestrial applications. Solarex was one of the two companies that pioneered this field. By 1983, it became the largest PV Company in the world, when it was sold to AMOCO. Dr. Varadi continued consulting for the European Commission, World Bank, NREL, and other organizations. His book Sun above the Horizon, which describes the meteoric rise of the solar industry, and its sequel, Sun towards High Noon, were published in 2014 and 2017, respectively. Frank Wouters has been leading renewable energy transactions and technology development for over 28 years. He developed projects valued at over $5 billion, ranging from small-scale PV solar electrification in Uganda to a strategic equity investment in the world’s largest offshore wind project in the UK. Mr. Wouters has served on the boards of several energy companies in Europe, USA, Africa, and Asia and currently is director of the EU GCC Clean Energy Network. Previously, he was deputy director-general of the International Renewable Energy Agency (IRENA). Allan R. Hoffman holds a bachelor’s degree in engineering physics from Cornell University and a PhD in physics from Brown University. Trained in experimental physics, most of his career has been in the planning and management of clean energy technology programs. He has served as staff scientist for the U.S. Senate Commerce, Science, and Transportation Committee and in senior positions at the National Academy of Sciences and the U.S. Department of Energy. Hoffman is a fellow of the American Physical Society and the American Association for the Advancement of Science.